When I first heard about Uber a few years ago I remember thinking that it sounded like an awesome idea – a super millennial-friendly alternative to cabs that also helps people make more money on the side driving their own cars. As you know, I'm all about making extra money. I think it's an essential part of accelerating your financial journey. You can save money all day long and limit your spending (and trust me… I've been there), but the reality is that you can only cut out so much. It's just math, right? Ridesharing apps, like Uber and Lyft, have so far proved the test of time and now you can find rideshare companies in most major cities. I actually use Uber if my wife and I are going to a party or a sporting event (where I may or may not be enjoying some adult beverages). It's convenient, and the Uber drivers typically tell me that they enjoy driving for money in their spare time. But, is driving for rideshare companies like Uber and Lyft really worth it? Here's why I'm even talking about this: I want you to pick an awesome side hustle that actually helps you make a bunch of money. Over the past few years that I've been running M$M, I've definitely found that some side hustles are great, and others turn out to be more of a hassle than they are worth. 5 Characteristics of a Great Side Hustle– This is from the Laptop Empires podcast, which is me and my buddy, Mike Yanda, talking about online businesses. We dive right into the question of what makes for a good side hustle. True Confessions – I Was a Side Hustle Skeptic– This article was written by my editor and focuses on her experience, explaining the difference between a side hustle and part-time job. Hint: It’s flexibility and how possible it is to go full time with your side hustle. As a consumer, rideshares have become a practical option for those of us who need a safe ride home, or as something besides a rental car while on vacation, etc. The prices are usually less or comparable to taxi services, and there is something cool about knowing you’re being driven by someone who might be side hustling as a rideshare driver. As a driver, Uber and Lyft offer flexible schedules that you set yourself and pretty decent pay. What more could you want? Spoiler: You might want more than these companies offer. I once talked to a guy who was an immigrant, here in the states driving for Uber to help his son pay for med school. The guy was already doing well financially and just wanted to help his son get through school without taking on too much student loan debt. He figured he had the time to drive for Uber, so why not give it a try. I’d say that more often than not, the appeal of driving for a ridesharing company is a noble cause like that. These are the same type of people who might start any side hustle – they’ve got a need for extra cash and want something flexible. But, as I’ve started digging in to the realities of driving for these companies, I can’t help but ask whether or not it’s actually worth it? Or, how does it stack up to other side hustles out there? When you drive for a rideshare company, you are earning a portion of what a rider pays for the ride. And, it’s said that Uber and Lyft take around 25% of each ride. 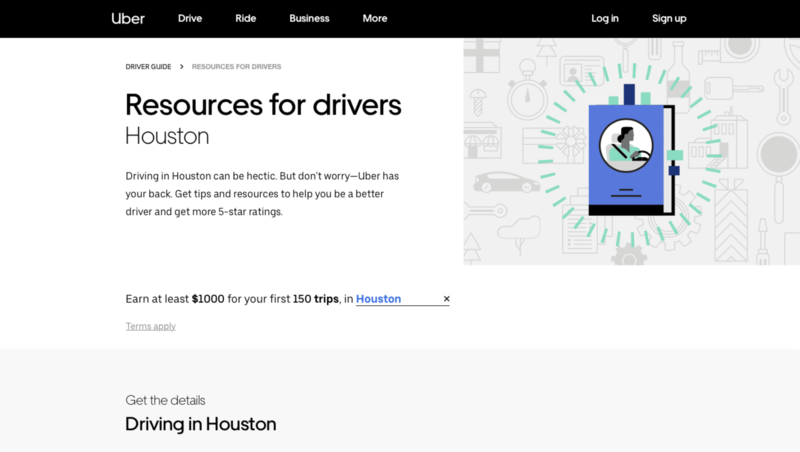 From Uber’s website, a driver in Houston, TX (where I live) can expect to earn $1,000 in their first 150 trips. Lyft’s website doesn’t seem to offer a clear breakdown like that, but I’m going to assume it’s pretty similar. Now, whether or not that’s driving during peak hours is unclear, but you’ll also have to consider that there is going to be some amount of time when you’re just sitting around waiting for a ride request. Nerdwallet broke down what it would take to earn $50k, $75k, and $100k per year as a rideshare driver. They found that at $50k, you would need to provide 60.21 rides per week. If you think about how you already use these companies, that probably equals more than 60 hours per week. They also looked at the average per ride cost for both Uber and Lyft, finding that the average for Uber drivers is $15.97, with Lyft at $11.48. Remember, though, that’s per fare, not your take home pay. To understand what you’ll be earning and whether or not driving for Uber is worth it, or any other rideshare service, there are some costs you’ll need to factor into your earnings. Wear and tear of your car. Insurance, and this isn’t normal insurance. You can read about this from the Rideshare Guy for more details. Cleaning supplies… gotta keep your ride looking fresh. … Taxes. As a rideshare driver, you are considered an independent contractor, which is an important consideration at tax time. Again, the Rideshare Guy has a lot to say about taxes for rideshare drivers, and honestly, this website is an amazing resource for those currently driving and those who are interested. I’d say that I primarily use rideshare companies when I’m traveling for work stuff. Believe it or not, I actually do get out of my house sometimes and do real business things from time to time. Usually, rideshare drivers can offer insights and advice for where the best place for a burger is, the best new micro-brewery, etc. It almost feels like you have a built-in travel guide, which is really cool. I bring this up because to be the best possible rideshare driver, the one earning five-star reviews, you will need to know the city you’re driving in. I think this is something consumers have come to expect. That isn’t to say that you can’t successfully drive for a rideshare company as a recent transplant (see what I said about the immigrant driving for Uber to help his son pay for med school), but being familiar with your area will be an advantage. If you don’t know the area, then take some time to review local guides, talk to other drivers, etc. Companies like Uber and Lyft sell new drivers on the ability to create their own schedule, which you can do. But, your greatest earning potential will come from driving during peak hours. There are naturally going to be certain hours of the day when more people are needing rides and hours when fewer drivers are available. Put those times together and you have Uber’s surge pricing or Lyft’s Prime Time. Going to work morning hours, think out of town business people needing rides to and from their hotels. Early, early morning hours, you know, the hours of shame. Weekend evenings, like heading out to eat and to and from bars and venues. Those peak hours are going to be important considerations when thinking about whether or not driving for Uber is worth it. It’s whether or not you’re able to drive those hours that will determine if you can make the most money. Getting in a messy car is gross. Getting in a smoker’s car is gross (not trying to be judgy, but I don't smoke and it's frustrating to smell like smoke when I don't want to). Getting in a car that looks like it recently took a group of preschoolers home from McDonald's would be a huge turnoff too. And, because your rideshare car is likely going to be what you use for your IRL driving, it might get messy. But, consumers don’t like this stuff. I mean, do you? Keeping your car clean might not be a huge downside to rideshare driving, but it will be an important time investment for keeping a five-star rating. Also, what if you pick up a group of guys or ladies on their way home from a bachelor or bachelorette party and one of them pukes up Red Bull and vodka all over your backseat? That’s on you (sorta – the customer will be charged a cleaning fee…but you still have a stranger's vomit in your car which is never a good thing). I’m not sure being a rideshare driver necessarily qualifies as being your own boss. You are an independent contractor who is side hustling with one of these companies. That means you’re subject to their terms, pricing, etc. So, if you’re thinking about being a rideshare driver to be your own boss, think again. There are so many other side hustle options that give you more control of your time and earnings, and that’s what actually makes a side hustle a good one. My favorite is running Facebook Ads for small businesses. If you’re interested in starting, my Facebook Side Hustle Course teaches you everything you need to know to start earning $1,000 a month in just a few hours a week, not the 40+ you’ll need to work as a rideshare driver. My final word on being a rideshare driver, or is driving for Uber worth it as a side hustle? With any side business, there will be a number of things to think about, not least your flexibility and earning potential. So, will driving for Uber or Lyft earn you money? Yes. Do they let you set your own hours? Yes. But, are there lots of other factors to consider? Yes. Even more important, are there better options? YES. For real, legit side hustles to start this year, check out 7 Side Hustles You Can Actually Start in 2019. Have you ever tried driving for Uber or Lyft? Was it worth it? As an Uber driver, We actually get 50-60% of each ride, not the 25% the author says. It works out to about $1 a mile while on a trip. Its officially $.66 per mile and $.15 per minute. The $1000 for 150 rides is also BS. I’ve made $1200 on 60-80 rides. I’m in the Buffalo NY area too, not a major metropolitan area like NY or SF. Yo! I think you misread that particular stat – it says that Uber and Lyft take 25% (not that drivers only get paid 25%). Rideshare guy has a cool article that I linked to that goes deeper into what drivers actually get per ride. As far as the $1,000 for 150 being BS, that information was literally pulled from Uber’s site. I’m glad you’re making more on less rides though! I’ve been driving for Uber and Lyft for 5 years. Now that I am debt free, I only drive 15 hours per week; and weekends only. I avoid weekday driving and the nutty drivers out there. That’s awesome! I’ve talked to a lot of drivers that really seem to enjoy it, and a few have told me that they really enjoy it because they get to meet cool people. You’re right. Car cleanliness is key. If a rider messes up your back seat, it can ruin your whole week. And Lyft does not compensate very well. And humans are so smelly, I am in no rush to go back where you can get fired at any time for ratings not to meantion the crazy drivers out there. So a ride to the airport for me is about 14 miles and in rush hour is 40 or so minutes, so basically $19. About 50% of ppl in my experience tip on airport rides so you might get $22. Sounds ok, but then you can’t pick up at the airport on the way back. You have to go to a rideshare lot and wait. At best you might get $40 for 2 hours, less gas, and car expenses. Then as an independent contractor you are responsibility for paying into social security so 15% of your pay is wiped out, whatever is left is then taxed as income. So you’d be lucky to net $13 an hour. I still do it In small amounts, but I don’t give pool rides as they are the worst . Anyway. It used to be a better job but the recent cut cut pay by 30% for me. Never drove with them again. Woah that’s weird! I’ve never been in an Uber where the driver wasn’t using a phone or had one visible. Must have been a weird rider?